In preparation for Breast Cancer Awareness Month October 2015, Hyundai Construction Equipment Americas began selling custom pink shirts and wristbands through participating Hyundai construction and forklift dealers across the United States and Canada, with 100 percent of the proceeds going to It’s The Journey, Inc.
It’s The Journey is a Georgia-based non-profit organization that raises funds and awareness for regional organizations focused on breast cancer education, screening, early detection, supportive services and continuing care. 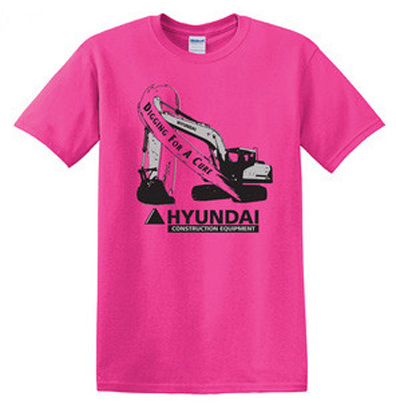 The pink Hyundai “Digging for a Cure” T-shirts sell for $12 each. The pink Hyundai wristbands sell for $5 each. Kang noted that the customers who own and operate Hyundai construction equipment and forklifts tend to be active participants in their local communities, so Hyundai is following suit by supporting It’s the Journey’s flagship event, a 30-mile, two-day walk, originating in Atlanta near Hyundai’s North American headquarters. Specifically, Hyundai sponsored a “B’Rest Stop,” where snacks and drinks were provided to race participants.